Eliminates the introduction of bubbles and air-locks into the cooling system and dramatically reduces system filling time. No more time-consuming system bleeding. Reduces fluid waste and messy spills. Automatically conducts system leak test. Low profile design broadens application range especially for use on MPVs where lower windscreen lip might obstruct other tools. 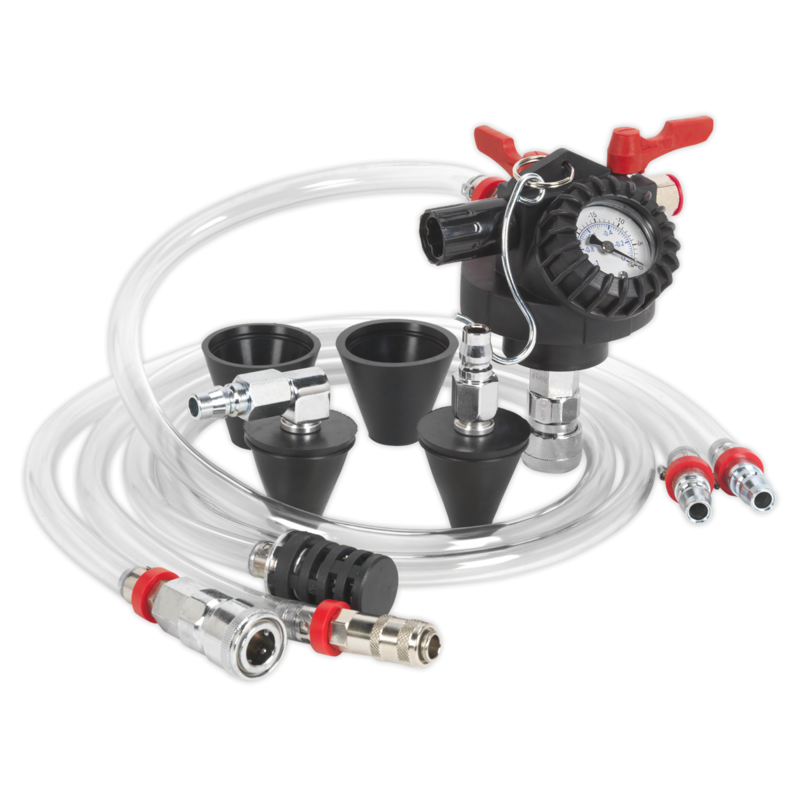 Simple operation requires workshop air supply and does not require fiddly interchange of vacuum and fluid hoses - as found on other versions of this tool. Can be you used in conjunction with Model No's VS001, VS0011, VS0033, VS006, VS006F, VS006V, VS0013 and VS0014 cooling system pressure caps as an alternative way of connecting to the coolant reservoir. Supplied with 1.3m fluid hose. Eliminates the introduction of bubbles and air-locks into the cooling system and dramatically reduces system filling time. No more time-consuming system bleeding. Reduces fluid waste and messy spills. Automatically conducts system leak test. Low profile design broadens application range especially for use on MPVs where lower windscreen lip might obstruct other tools. Simple operation requires workshop air supply and does not require fiddly interchange of vacuum and fluid hoses - as found on other versions of this tool. Can be you used in conjunction with Sealey cooling system pressure caps as an alternative way of connecting to the coolant reservoir. Supplied with 1.3m fluid hose. Sealey VS0011 Cooling System Pressure Test Kit 25p . . .
Sealey VS0042 Cooling System Vacuum Purge & Refill . . .